Protests in Ukhrul on August 30, 2014 defying govt ban on rallies and sit-ins. Image courtesy Facebook page of the Protest Against SEC 144 Crpc Promulgation in Ukhrul. At least two persons were shot dead and more than 10 injured after Security Forces opened fire on protestors in ‪‎Ukhrul, a district nearly 85 kilometres from the capital of the Indian state of Manipur, on Saturday, August 30, 2014. The current unrest in Ukhrul dates back to mid-July, when an unidentified gunman assassinated Ngalangzar Malue, a member of the local Autonomous District Council. No one has claimed responsibility of the murder. On July 13, the Government of Manipur sent hundreds of Manipur Police Commando (MPC) and Indian Reserved Battalion (IRB) into Ukhrul, where officers arrested eight cadres of the Naga separatist group, the National Socialist Council of Nagaland (NSCN-IM). The government also imposed “Section 144 of the Criminal Procedure Code (CrPC) of 1973,” which empowers a magistrate to prohibit an assembly of more than ten people in any single area. Until this summer, a “ceasefire” between the Government of India and the National Socialist Council of Nagalim (NSCN-IM) had been in place since 1997. According to the Naga Peoples Movement for Human Rights (NPMHR), the imposition of Section 144 has suspended the freedom of movement for the people in and around of Ukhrul District Headquarters, harming local businesses and interferring with everyday life. 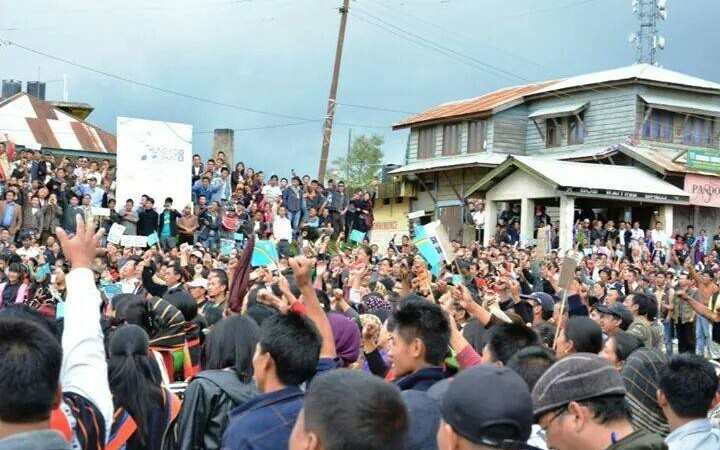 The people of Ukhrul have protested the imposition of Section 144, demonstrating peacefully on several occasions. A timeline of the rallies can be found here. 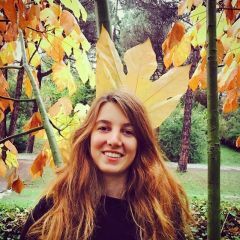 On a dedicated Facebook page, activists have documented the protests since the middle of August. 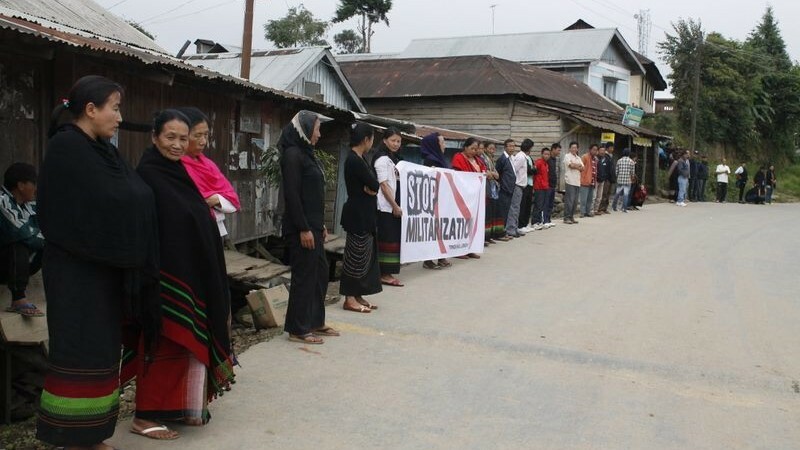 Protests to stop militarisation at Ukhrul. Image courtesy the Facebook page of the Protest Against SEC 144 Crpc Promulgation in Ukhrul. 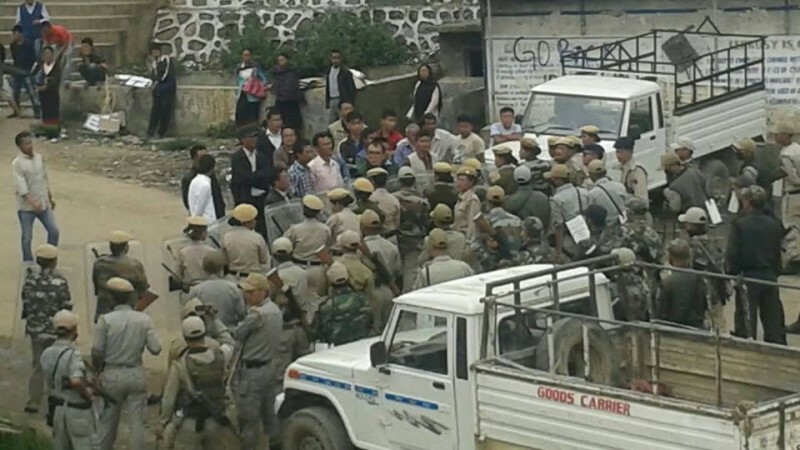 On August 11, 2014, police disrupted sit-ins planned in more than 20 places across Ukhrul. Protesters met with resistance by security forces. Image courtesy the Facebook page of the Protest Against SEC 144 Crpc Promulgation in Ukhrul. The chronic hostility of the Government towards the hill tribes and the constant weakening of the constitutional provisions safeguarded for the hill people are absolutely unacceptable. The attempt of the government is nothing but to usurp the right of the hill people and in particular the Naga’s right to free practice of customary law, ownership of land and civil autonomy. Some protestors in Delhi were beaten up by police on August 17, 2014. 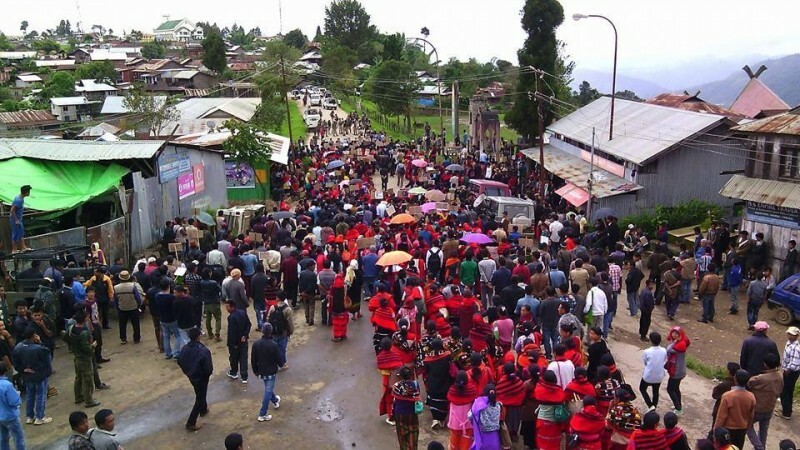 The United Naga Council, an apex organisation of the Nagas in Manipur, declared that mass rallies will be held on August 30 in four Naga-dominated district headquarters of Tamenglong, Senapati, Ukhrul and Chandel in Manipur. Demonstrators’ primary demand is that the national government expedite the resolution of an acceptable and honourable settlement of the Indo-Naga issues and expediting the peace process. The rallies also oppose the alleged militarisation of the Ukhrul district, which ostensibly violates the Indo-Naga ceasefire. On the evening of August 29, however, the district's local government stationed loudspeakers throughout the area, announcing that police would not allow any public gathering, as Section 144 was still in force in the area. With protesters already committed to the next day's demonstration, clashes on August 30 became sadly inevitable. Naga people protesting on August 30, 2014. Image courtesy Facebook page of the Protest Against SEC 144 Crpc Promulgation in Ukhrul. RT @khanthing Apart from the District police, other 2 units that fired upon protesters in #ukhrul , Manipur were counter-insurgency units. As social media exploded with news of the carnage in Ukhrul, India's mainstream media remained largely silent. 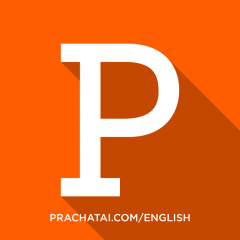 Ngathingpei Khayi, for instance, pointed out the lack of coverage in India's mass media. Note: This is a developing story. 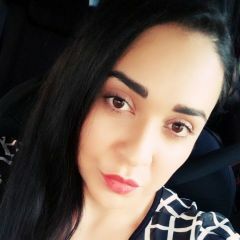 If you have updates please add in the comments section. See the updates on the postmortem on the teo deaths here https://www.facebook.com/pages/Protest-Against-SEC-144-Crpc-Promulgation-in-Ukhrul/905429992818614, also, the fb profiles of Naga people are all black today. Amen, shame on the Indian government.